No one wants to think about gum disease. We tend to act as though the less we know about it, the less likely we are to suffer from it. That could not be further from the truth. Here are the top 7 things you don’t want to hear about periodontal disease that you really should. #1 You have a 50% chance of developing serious periodontal disease if you are over 30. The sad fact is that, according to a major study undertaken by the CDC (the Centers for Disease Control) most adults have a fifty/fifty chance of having serious gum disease. That doesn’t include minor gum disease, which is believed to be far more widespread. #2 That pink in the sink might not just be from brushing too hard. Even a little pink in the sink can be early sign of gum disease. Because gum disease is most successfully treated early, it’s important not to ignore early warning signs of a problem. Early gum disease, gingivitis, often starts with swollen, red, or bleeding gums, but not much discomfort. Check with your dentist promptly if you start to notice bleeding gums; don’t wait for a small problem to become a big problem. #3 If you like your teeth where they are, you really should pay attention to your gums. You gums provide the strong, stable base needed to keep your teeth in your head. In cases of advanced periodontal disease that remains untreated, teeth often shift and can be lost. Receding gums deserve prompt attention from your dentist. Restorative techniques work better early, particularly if you would prefer to avoid gum restoration surgery. #4 Ignoring periodontal disease can get expensive. Problems are most successfully treated when treated early. Likewise, treatments are less costly when started early. The average cost of antibiotics is far lower than the average cost of surgery. In fact, while a deep cleaning to remove gum disease may cost $200 dollars, surgery to restore gum issue can cost $1000 or more per section of the mouth. It’s more cost effective to visit the dentist for regular cleanings and avoid gum disease all together. #5 Good gum care should begin before the first baby tooth erupts. Parents should gently wipe the gums of their infants with a clean, damp cloth. This helps keep unhealthy bacteria from getting established in the growing baby’s mouth. Parents should also avoid sharing spoons with their babies and should not attempt to clean a dropped pacifier by putting it in their own mouth. A parent already has bacteria established in their own mouth and should avoid passing their bacteria to their child. #6 Your gum health is part and parcel of your heart health. There is some compelling evidence to suggest that gum disease can aggravate heart disease. The bacteria that is most closely associated with gum disease is also found in the plaques that build up with arteriosclerosis. People with untreated gum disease also have more heart attacks than people without gum disease. Both gum disease and heart disease are inflammatory processes, and doctors generally agree that it’s important to treat both. #7 If you have advanced periodontal disease, the follow up care takes a long time. Once you have a deep cleaning and scaling to clear out the pockets where infection flourishes and have slowly releasing antibiotic pellets inserted, you’re not done with treatment. At home antibiotic therapy, perhaps including an antibiotic rinse, and 4-6 times a year follow up visits are normal, and cost you both time and money. Really, your best bet is to catch disease early or stop it before it starts. 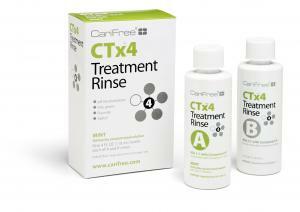 CTx4 Treatment Rinse contains a safe antimicrobial agent to stop the overgrowth of dangerous bacteria. It can be a beneficial part of your daily oral care routine, particularly if you are showing signs of early disease. And, there is no substitute for having a good relationship with your dental care professionals and visiting them regularly so serious problems don’t pass unnoticed.